Here they are, a-hem, “aristocrats” all! Alfonso Antonio Vicente Eduardo Angel Blas Francisco de Borja Cabeza de Vaca y Leighton: womanizer and inept race car driver who killed himself, a co-driver and nine spectators, most of them children, on a race through Italy — he had more letters in his name than years in his life…he died at 28. Mark Birley: ultra-conservative English club owner and snob (at least he liked dogs). Monsieur Malle: couldn’t you find any good-looking/stylish men who were decent human beings to inspire you? If not, you should have called Monsieur "Vulgarian" instead. I’m almost disappointed to say, given the above, that I adore Monsieur; but I’ll reserve my Bravo! for Bruno Jovanovic, the perfumer. Monsieur starts with a deep rum aroma mixing with tangerine “bitters;” the tangerine is dense, not effervescing. Beginning almost at once, I smell a mysterious-musty patchouli aroma; the patchouli is green and vegetal in character in the early stages of Monsieur, a bit bitter and sour. In its heart, Monsieur presents very musky leather with cedar and a tinge of dried-piss smell; this leather is like the leathers you find for sale in the souks of Morocco: raw, verging on the unpleasant in scent and strongly scented. (In case you didn’t know, urine is part of an ancient recipe for curing/softening hides). The opening phase of Monsieur, which lasts about 45 minutes on my skin, can be described as rum muddled with tangerines served in a smelly leather boot whose wearer inadvertently (or not) peed on it. I applied Monsieur to my skin and drenched a large paper strip with it, too; the paper intensified the urinous/cedar notes, so try this perfume on skin before dismissing it outright. Monsieur’s leather (or “suede” as it's described on the Frédéric Malle website) slowly becomes “tarry,” with a pleasant aroma of freshly ground black pepper on the exhale. The base of Monsieur is beautiful: vanilla-rich amber mixing with strong, silky patchouli. If you don’t like patchouli, you won’t like Monsieur; and if “dirty” perfumes don’t suit you, this probably won’t either. 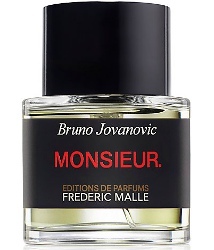 Monsieur has Character; it’s my favorite Malle perfume in ages. If I could choose the human symbol of Monsieur it would be a mademoiselle: Janis Joplin. I imagine her smelling of patchouli, cedar and leather. And I think she could have put all the cads listed above in their places. Editions de Parfums Frédéric Malle Monsieur is available in 100 ml, 50 ml, three 10-ml travel sprays or one 10 ml travel spray ($290, $200, $140 and $56 respectively). For buying information, see the listing for Frédéric Malle under perfume houses. 1. Ed. note: the fragrance's official name is "Monsieur. "; at least one publication (Wallpaper) is calling it "Monsieur Dot". We are ignoring the dot altogether. 2. serial adulterers and cheats. 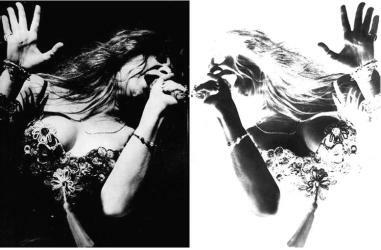 Note: top images [right image altered] of Janis Joplin via Wikimedia Commons. All this time I have been imagining Malle (et al) was a class act. Guess I was wrong, but happy you liked the scent. ???? Deva…the scent was a pleasant surprise! There’s something slightly intriguing about taking inspiration in those kinds of men – clearly “bad boys” of sorts, but ones who managed to be in the top tiers of society. Even if you don’t like them, it is a bit interesting to think that they might wear the scent created for them. Jenkr…as we all know, everyone has a fan somewhere! I will stick with Imagining Joplin in this one. Lovestosmellgood…I’m hearing ‘Me & Bobby McGee’ in the background…ha! I’m hearing “Bye, bye baby” and imagining Janis kicking those guys’ butts with her leather boot. Great review, Kevin, thank you! It’s cool that you can appreciate the fragrance despite all this promotional nonsence. gravity..I’m used to ignoring the promotional nonsense…we all are, right? Should have put Bye Bye Baby Bye Bye as the soundtrack to the review. Laura…let’s hope they’ll do a Madame next…. Yikes. Leather, no. And I’ll skip the pee part too. There is not enough persuasion in the world… I’ll stick to Geranium pour Monsieur to get my manly kicks from FM. Anns…that one’s downright girly compared to this one, ha! I can deal with a little more manliness than that. Maybe FM’s next fragrance can be gentle lumberjack? The fragrance sounds seriously enticing, the inspiration not so much. The only Monsieur I knew the name of was Gianni Agnelli, who doesn’t seem like the worst of this bunch. I wonder what the reasoning was in publishing this as the inspiration. Austenfan…a strange bunch for sure…the more you know about them the less you wish you knew. Bet most consumers won’t research them…just do a quick image search? I know of Alfonso de Portago, only because of his wife, Carroll at the time of when he died was from the backwoods of South Carolina and later married to the guy who founded Toy’R’Us, but sometime in between or whenever she had an affair with Charles Englehard Jr, inspiration for Goldfinger in Goldfinger (lol) and stepfather to Oscar De La Renta’s wife, Annette. Anyway to cut this already long and pointless story short, Englehard gave money to the MET in NYC and got a section named after him and to spite his widow and stepdaughter who hated Carroll, when she married Mr. ToysRU$ she gave money and got the section in the museum right next to Englehards named after Mr.ToysRUS. chandler b: the “K’mart cousin” … love it! These guys are disgusting, may I borrow your JJ association so I can give the perfume a fair try? I see that Frederic Malle worked on the 1990s Mark Birley perfume. I feel quite repulsed by the thought of this one. But i suppose a perfume called “Arseholes” wouldn’t sell. Kanuka: probably not…or at least not at the Malle pricing. Sorry…that was a bit rude. Loved your review, as always. I’m more than slightly aroused. Ahem, intrigued. I’m more than slightly intrigued. Dusan: well then…pour it all over your body and then toss the bottle in the garbage…a fitting “Monsieur” treatment! Gosh, that would be wasteful! Ah, Dusan…you don’t have the heart of a true ‘Monsieur’! (That’s a good thing) ha! I’m afraid I rather am not. I can’t even pronounce the word properly without sounding like I’m about to cough up something nasty! But hey, I guess that means I might have a chance with Dutch. Wastrel would be a great name for the right perfume, e.g., an animalic, boozy leather with cologne top notes. Noz: excellent! I would add a touch of cigarette smoke, too. “…. “a hardened alcoholic who, without ever taking precautions of any kind, has slept with more whores than a porcupine has quills”. You know, the cologne had better been called PIMP$. And yes, I do think the glorious Janis Joplin would have been all about this scent- and would have kickboxed those guys out of orbit! Ede…without taking precautions!? Let’s call it Garnishments? *child support?